After doing the boat crossing from Java to Bali late yesterday afternoon, I headed straight for the heart of its cultural pulse, a town called Ubud. I liked it immediately. I slept in a quaintly decorated Balinese room with a four-poster bed (under the mandatory mosquito net) and showered in an open air bathroom with the sun streaming on my face. I was then served breakfast on my own little front porch by a man in traditional dress. What was there not to like? Despite having had breakfast, by 11.30 I was hungry again. Must be all the fresh air, and although it was still hot, the temperatures were tempered by a nice cool breeze. 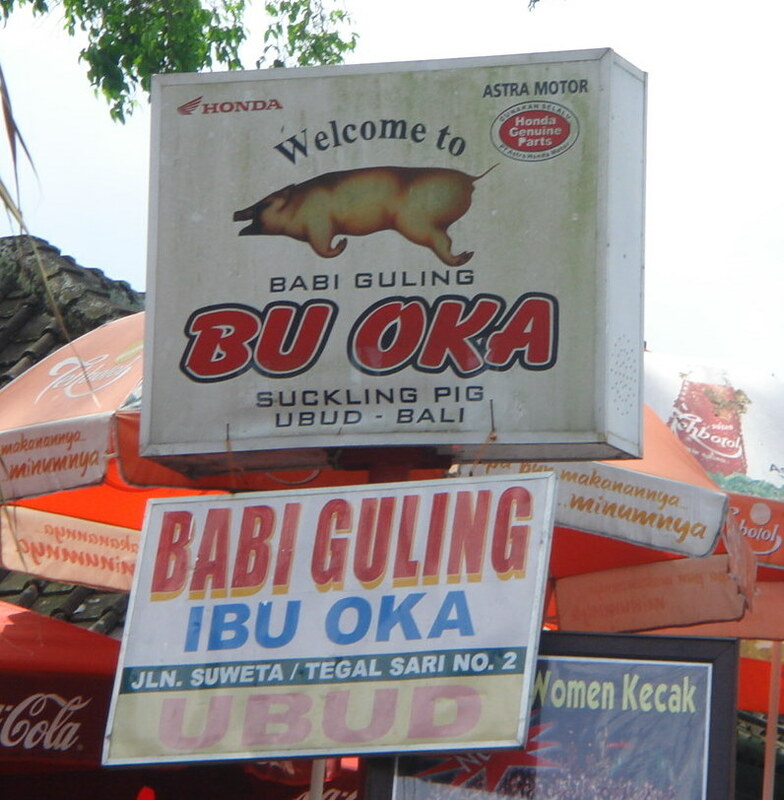 I placated my grumbling stomach with a short-term fix of an ice-cream cone and headed off in the direction of the markets to look for lunch, whereupon I stumbled upon Babi Guling Ibu Oka. Babi guling translates as roast suckling pig, a Balinese specialty, which from my reading of Bali was a must try. This and the fact that it was barely 11.45 and the place was virtually packed with a throng of people queuing to be served told me I was onto a winner. I spotted a seat and settled in. It was a simple place; communal seating, plastic chairs, cutlery in “serve yourself” plastic containers, but buzzy with the hum of the crowd. Balinese food is well known for its use of many spices and I had hoped this meal, being my first in Bali, would provide me with an introduction. Furthermore, having travelled Java for some 12 days already, I was also curious to see how Balinese food might differ from the Indonesian food in Java. The choices on the board were, well, roast suckling pig. I ordered the standard option with rice, although there were various derivations, for example, a meat option without the rice. The babi guling was shredded into small pieces, garnished with a spicy gingery-based dressing and accompanied with blood sausage, crackling and a finely chopped green bean salad. The meat was glorious, meltingly tender and juicy, and the crackling superbly crunchy with a light layer of fat so irresistibly delicious I just had to break every rule I had about not eating fat. The spicy gingery dressing and the side of bean salad were both tremendously interesting with a multitude of different flavours. Spicy, hot, sweet, gingery, garlicky, coconuty all at the same time, I was completely mesmerised by the tastes that titillated my tongue. If this was indicative of all Balinese cooking, then it was indeed spicier than Javanese cooking. 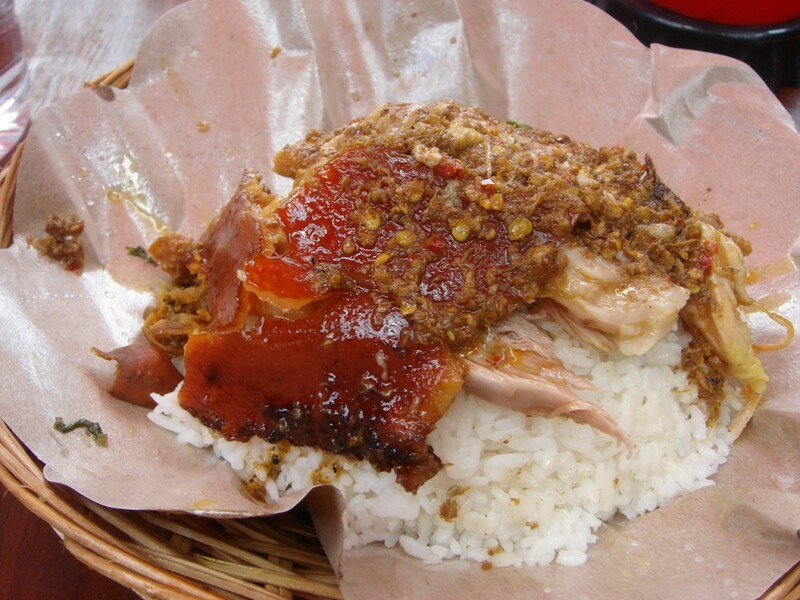 Curious to find out more about babi guling, I pinned Agun down for more information. He’s part of the family empire that is Babi Guling Ibu Oka. Ibu Oka is the owner and she and Agun are related through the same great grand-father. 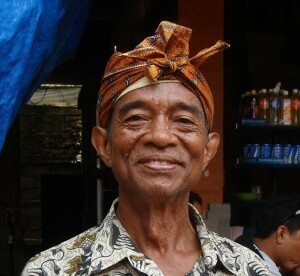 It was his father’s generation that had been first approached by the then King of Ubud to make suckling pig for the palace. It proved a success and a stall in the nearby markets was set up for the locals in the 1940s. 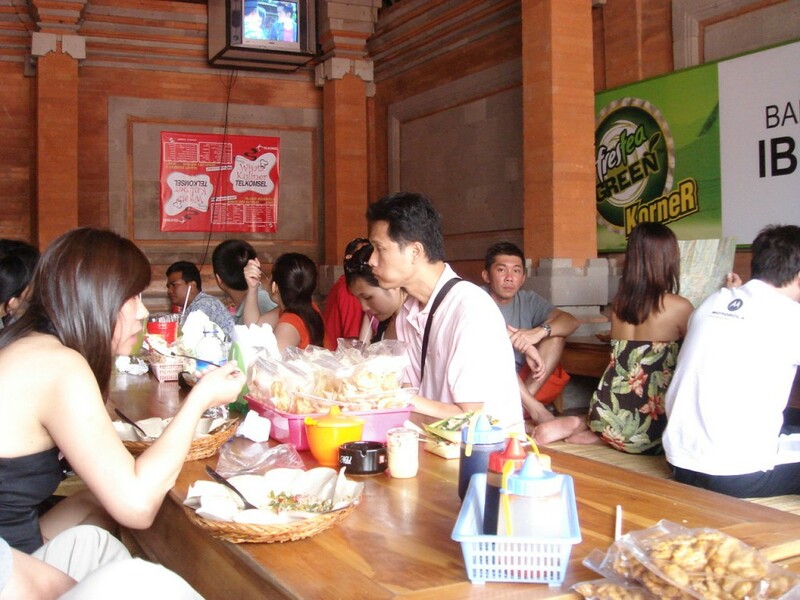 In 2000, the current restaurant was opened for tourists, and the rest as they say is history. The preparation process starts early, at 5am, with the slaughter of the pigs to be used that day. The roasting takes place next to Agun’s house and about six pigs are roasted each day, more on festival days and on other important occasions. The cooking starts at around 6.30am and continues at half hourly intervals till all the pigs are cooked. The roasting is done by hand and it’s the use of the time-held tradition of roasting over wood that Agun says is what gives the suckling pig its intense flavour. The fire needs to be extremely hot to both sufficiently crisp the crackling and to ensure that the bones do not break as would happen over a lower heat. Well, I was completely seduced; not just by the gloriousness of the meat or the wonderment of the spices in the dish, but also by the cooking process. “May I come see the roasting of the pigs tomorrow?” I inquired (see my “Babi Guling Ibu Oka: The roasting of a suckling pig” story). Surprisingly the answer was yes. I couldn’t wait.